...vidyAvatAM bhAgavate parIkShA - The test of scholars is how well they understand the Bhagavata Purana. beheaded His uncle Kamsa, killed the Kauravas and others, and looked after the sons of KuntI. This is the story of BhAgavata PurANa which describes the nectar-like play of Lord Krishna. History of Srimad Bhagavatam is described in the beginning and at the end (SB 12.13.19). After compiling the Vedic literature, Puranas, etc., Vyasadeva was still feeling unsatisfied. While thinking in this way Narada Muni reached the cottage of Vyasadeva and was asked about the cause of dissatisfaction. Narada Muni explained that because Vyasadeva did not directly describe Krsna's pastimes, and instead gave a license to enjoy sense gratification under religious principles, he was remaining unsatisfied. Narada then instructed Vyasadeva in the catur sloka, or catuhsloki (SB 2.9.33-36) the essence of the Veda. Vyasadeva took these four verses and expanded them to compile the Srimad Bhagavatam, which is known as the ripened fruit of Vedic literature because it directly describes Krsna's transcendental pastimes. It is also zruti sAram ekam, the cream of srutis (SB 1.2.3) and as such it is considered the best pramana by Gaudiya Vaisnava acaryas. Vyasadeva has written SB in his spiritual maturity absorbed in trance: samAdhinAnusmara tad-viceSTitam - "In the trance you are thinking about Lord's pastimes and describing them." (SB 1.5.13). A Purana has five characteristics as opposed to an Akhyana. (The scriptures are divided into three classes - sattvika, rajasika, and tamasika.) The glory of Lord Hari is greater in the sattvika Puranas; the glory of Lord Brahma is more in the rajasika Puranas; the glory of Lord Siva and Agni is more in the tamasika Puranas. In the mixed scriptures the glory of Sarasvati and the Pitrs is explained." "Creation, dissolution, genealogy, manvantaras and descriptions of the activities of famous kings, these are the five characteristics of a Purana." (Lord Siva:) "Know that the Matsya, Kurma, Linga, Siva, Skanda and Agni Puranas are the six tamasika; the Visnu, Narada, the auspicious Bhagavata, Garuda, Padma and Varaha Puranas are the auspicious sattvika Puranas, o beautiful lady; the Brahmanda, Brahma-vaivarta, Markandeya, Bhavisya, Vamana and Brahma Puranas are known as rajasika. Sattvika Puranas are said to give liberation, rajasika Puranas everything inauspicious and tamasika Puranas cause one to go to hell, o Devi. Thus they should be remembered as endowed by three gunas." "That which explains the topmost principles of religion, basing it on Gayatri, and which has the incident of the killing of Vrtrasura is to be known as the Srimad Bhagavatam. This Purana has eighteen thousand verses. Whoever makes a copy of the Srimad Bhagavatam and, placing it on a golden lion throne, donates it on the full moon day in the month of Bhadra (August-September), will attain the supreme goal." "That which gives accounts of the humans and demigods in the Sarasvata Kalpa, explains the supreme religion, basing itself on Gayatri, and narrates the slaying of Vrtrasura is to be known as the Srimad Bhagavatam. It has eighteen thousand verses. Whoever makes a copy of the Bhagavatam and donates it, on a golden lion throne, on the full moon day in the month of Bhadra, will attain the supreme destination." These verses are also found in the Agni Purana (272.6,7). Again, in the Padma Purana, in the section glorifying the vow of Vyanjuli Mahadvadasi, Gautama instructs King Ambarisa, "One should stay awake (on the night of Vyanjuli Mahadvadasi) and hear the scriptures that narrate the stories of Lord Visnu and His devotees, especially the Bhagavad-gita, the thousand names of Lord Visnu, and the Purana narrated by Suka (Srimad Bhagavatam). These should be recited with care since they are pleasing to Lord Hari." In the Prahlada Samhita of the Skanda Purana, in the section describing the glory of Dvaraka is this statement, "A person who stays up (on the night of Ekadasi) and recites the Srimad Bhagavatam with devotion in front of the Deity of Lord Hari goes to the abode of Lord Hari with all his family members." (Parvati said:) "...by that bhakti arises in me to hear the supreme Krsna katha. Among all the Puranas, the Srimad Bhagavatam, in which Lord Krsna is glorified at every step by various great sages, is supreme." "The nature of the Srimad Bhagavatam and the Personality of Godhead is always the same - full knowledge, bliss, and eternal existence." And the Padma Purana, Uttara Khanda (198.30, not in MUM e-edition) says: zrImad bhAgavatAkhyo 'yaM pratyakSaH kRSNa eva hi, "Without any doubt, Srimad Bhagavatam is directly Lord Krsna." "The Srimad Bhagavatam is the explanation of the Vedanta Sutra. It is the complete settlement of the Mahabharata. It is the complete commentary on the Gayatri mantra. It strengthens the explanation of the Vedas and is the topmost Purana, written by the Supreme Personality of Godhead. It has twelve cantos, one hundred sections and eighteen thousand slokas." If one hears Bhagavata grantha of 18,000 verses in twelve skandhas (cantos) spoken by Suka, one gets moksa. Supremacy of SB is established in SB itself (1.1.2-3, 12.13.15-16). An analogy about supremacy of SB: Vedas teach as a king (by orders), Puranas as a friend (by promises and blessings), Vedic poetry sweetly as a lover but SB contains all three aspects: all Vedic laws and principles, gives blessings and is poetic. Srila Prabhupada instructs in SB 2.2.12 p. that those who still have sexual desires should hold lectures only from 1. and 2. Canto. This refers to criticism of professional reciters who hold so-called Bhagavata saptahas (seven-day recitation) for material profit, focusing only on Krsna's rasa-lila pastimes in Tenth Canto to indulge their paying audience. Sarga, or creation; pratisarga, or dissolution; vamsa, or the genealogies of kings or sages; manvantaras, a duration of a reign of a Manu; vamsanucarita, the description of various sages, kings, and incarnations. The Srimad Bhagavatam is in twelve cantos, but the list of the characteristics of a Maha-Purana are in the Second Canto. 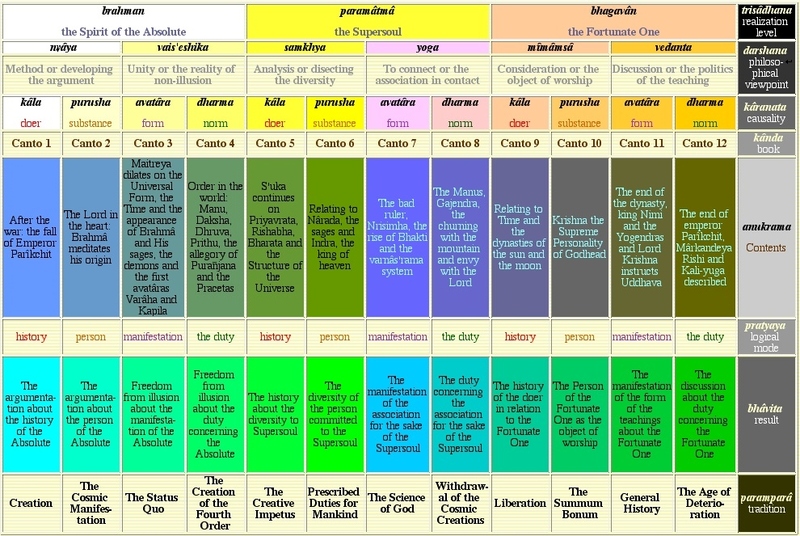 Some scholars conclude therefore that these ten topics are explained successively in each canto from the Third Canto onwards. Srila Jiva Gosvami has complete disregard for such an explanation. If a Maha Purana has ten characteristics and if the first two cantos of Bhagavatam had none of these, then the Bhagavatam proper would have ten cantos. Analysis shows, however, that the First and Second Cantos discuss sarga, visarga, and raksa. The ultimate purpose of the Srimad Bhagavatam is to explain the tenth item, Asraya, who is the Supreme Personality of Godhead. Digests: Shri Rupa and Shri Sanatana Gosvamis wrote Laghu and Brihad Bhagavatamrta, nectar of Srimad Bhagavatam. A short digest of these two works is Shri Bhagavatamrita Kanika by Shri Vishvanatha Chakravarti Thakura. Horacio Francisco Arganis Juarez. Graduate in Linguistics and Literature at U A de C and M.A. in Gaudiya Vaisnava philosophy and Theology in IBCH. Reseacher Professor in Saltillo, Coahuila, Northeast of Mexico. 13th century CE as a date for Srimad Bhagavatam was accepted by scholars until the half of 20th century. Nevertheless, the work Tahqiq-i-Hind by Alberuni, a Muslim who made a study of the India in the 10th century CE, mentions Bhagavata Purana. Nowadays the date 9th century CE predominates. The critics claim that the Bhagavatam mentions Hunas and thus it had to be written after their invasion to India in 5th century CE. Nevertheless, the Hunas are mentioned also in older texts such as Lalitavistara, a Buddhist work dated to 3rd century CE, and Mahabharata, a recognized archaic work. These evidences indicate that this race was known before the invasion and its mention in the Bhagavatam doesn't suggest any occupation. Others argue that Bhagavatam was influenced by the philosopher Sankara (commonly accepted: 8th century CE) because of similarity of ideas and of the language. But Gaudapada, teacher of Govinda who was teacher of Sankara, mentions the Bhagavatam in his Uttaragita-bhasya and in his commentary on Sankhya-karika makes reference to other two verses. There was an attempt to discredit those references under the supposition that it could be another, later author of the same name or that Bhagavatam took the verses from the work of Gaudapada. But one would have to show some historical reference that endorses that another author existed with such a name and he wrote these works. Nevertheless, the studies of experts like M. T. Sahasrabuddha tend to verify that those texts are of Gaudapada and that Sankya-karika-vritti and Uttara-gita don't only mention verses but the latter mentions directly the Bhagavata Purana. This was corroborated in another, independent work known as Nandi-sutra, a core text of the Jaina school, which gives a list of writings prohibited by their academy. It mentions directly Mahabharata, Ramayana, Purana-Bhagavatam, Mathara-vritti, Sankhya-karika, etc. This treaty was dated to 4th century CE under the notion that Vallabhi, its compiler, lived 980 years after Jain Mahavira (commonly accepted: 6th century BCE). The source of inspiration of the Vritti of Gaudapada was Mathara-vritti which contains the same two verses of the Bhagavatam. Sushila S. Desai disagrees, leaning on Belvekar who appeals to an argument of textual criticism which presupposes a contamination and alteration of the manuscripts. She even insists that in the Mathara-vritti translated into Chinese by Buddhist monk Paramartha in 5th century CE the texts of the Bhagavata contained in the commentary of Gaudapada don't appear. But it requires a series of specimens of the manuscripts, which the philologists like Alberto Blecua call the Collatio Codicum, to show that there are no such verses. It only indicates that in the manuscript that Paramartha used they could have been missing, or, as he belongs to a school opposing the Bhagavata school, he could have removed them since one of these texts (1.6.35) indicates fundamental points of the Bhagavata doctrine. Bhagavatam rejects the monist theory of the unity of souls and God, as well as the conception that God is ultimately impersonal and amorphous - this is the core of Sankara's philosophy but Sankara quoted Bhagavatam 12.13.1 in his poem "Meditations on the Gita" (text 9) and makes reference to the Bhagavata school in his Sariraka-bhasya. A. N. Chatterji confirms: "Even Sankara crediting [the doctrine of] 'Advaita Vedanta'... has taken into account the influence of the Bhagavata Purana." Like other scriptures SB is either manifested or unmanifested (as the Lord is sometimes seemingly born and sometimes He appears independently - Nrsimhadeva etc., similarly, the scriptures seem to be written by somebody because it is the common way of their origin. Actually, they appear in the author's heart and then they are written. They don't contain (and they are not limited by) history of certain yuga or Brahma's day. They are inaccessible to fools and rascals just as Krsna Himself. Jan: Two subsequent texts (2.17-18) of Canakya's Nitisastra (3rd century BCE/mainstream academic date or 16th century BCE/Puranic date) paraphrase two subsequent verses of SB (10.47.7-8). When was Bhagavatam written by Vyasadeva? Was the Bhagavatam Composed by Vopadeva, and not Vyasadeva?